I am becoming more known these days for my gripes than my enthusiasms. A long held complaint (extant at least 7 years) has been at the denuding of the middle ranks of miners. If one looks at the mining market from a Darwinian perspective (and that is particularly apt in these days of survival of the fittest) the pyramid of life (and we use that word under advisement in the mining space) is extremely out of kilter. We have a handful of majors and vast plethora of juniors and a mid-tier that is severely underpopulated. This is not a natural situation. If one wonders why mining M&A is in such a torpor one not look much further than the lack of mid-tier companies for majors to munch upon. Just as a T-Rex would not have bothered chasing a squirrel (if they had even existed conterminously) thus mining majors cannot be bothered snuffling in the undergrowth of Vancouver or Perth to look for transactions that are canapés rather than main courses. However, if we look at majors we have two ways in which they are created. One is by an existing historic major (BHP, Anglo-American, RTZ, Freeport-McMoran) devouring other smaller majors of mid-tier companies or by mid-tier companies bulking up through mergers with like-sized entities to catapult themselves into the top tier. Good examples of this are Barrick which went over decades, through a series of mergers from being nothing special to being a major (and still nothing special). Goldcorp, through its acquisitions of Glamis Gold and Wheaton River, is a better example of 1+1+1 equaling more than the sum of the parts. The mid-tier during the last decade and a half was not “restocked with names” because of the failure of Darwinian forces in the mining space. Having bemoaned however the lack of the md-tier we might also bemoan the lack of majors. There has been a massive concentration in this group which has resulted in a situation where, back in the 1950s, one could have pointed to a score of diversified majors (many US-based) to a much depleted band these days. The survivors have gone beyond the categorization as majors and now are more accurately described as behemoths. There was a spooky moment late last year when the threatened takeover of RTZ by Glencore threatened to even reduce the ranks of the behemoths. Fortunately this proved to be just an attack of wind by Ivan Glasenberg. There has been a spate of proposals in recent times to break up some of the biggest miners. BHP are spinning out South32, Vale are supposedly setting free the nickel (and other base metal) assets in a New INCO and Anglogold Ashanti went through gyrations last year first claiming it would spin out non-African assets and then doing an about-face. Chatter about RTZ disposing of diamonds or uranium interests, through demergers, surfaces from time to time. The Vale proposal is, I suspect, waiting to see how South32 goes (and also for a turn in the nickel price) while the Anglogold breakup is off the table (for now). However the South32 deal is very much alive and kicking, with a mid-May launch date. BHP-Billiton is of course a behemoth with a heavy weighting towards iron ore, coal and oil & gas, but a plethora of other activities. Some bright spark has clearly persuaded the management that it should get rid of lesser activities (like being the largest manganese operations in the world and owning the largest silver mine) and instead focusing upon its three core commodities which all have a weak outlook at the moment. Perish the thought it might be the same type of investment bankers that thought Time Warner AOL might be a good combo! So this looks like a “taking candy from babies” opportunity for canny investors. Big dumb corporation throws baby out with bathwater and the opportunity is to try and catch the baby mid-air. This makes for a very diversified company, by commodity and customer, with US$8.3bn of revenue in FY2014. 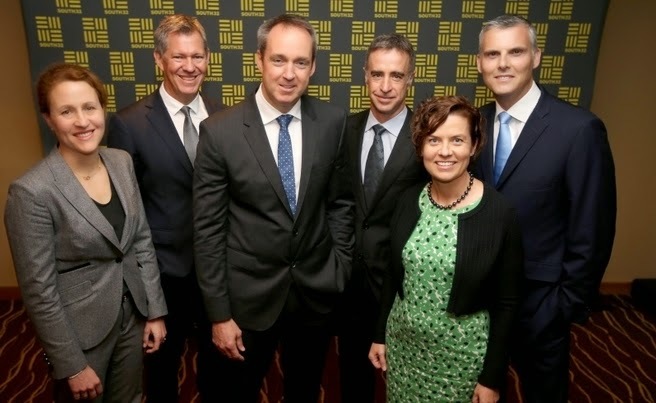 The new company will be headquartered in Perth and will have listings on the ASX, JSE and LSE. 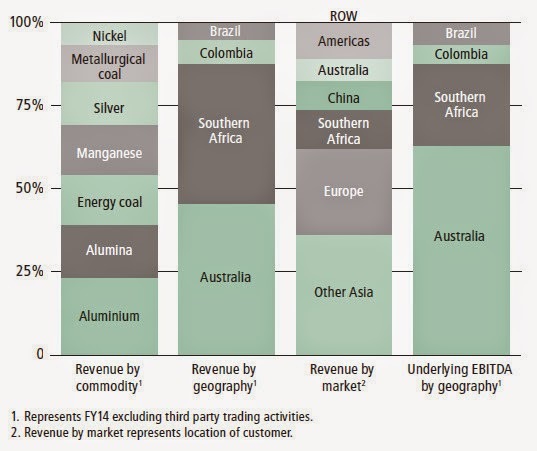 The new entity will be one of the major players in Manganese and aluminium; however as the chart below shows most of the revenue streams are rather well-balanced. Interestingly the company is way less dependent upon China as a customer than many other majors. Some have speculated that South32 might turn around and ditch the South African coal assets (to Mick Davis’sX2?). I would not shed a tear on that one. The opportunity then would come in bulking up the nickel part of the business, but more excitingly adding to the lead/zinc component to capitalize upon the Cannington position. Having bemoaned however the lack of the md-tier we might also bemoan the lack of majors. There has been a massive concentration in this group which has resulted in a situation where, back in the 1950s, one could have pointed to a score of diversified majors (many US-based) to a much depleted band these days. The survivors have gone beyond the categorization as majors and now are more accurately described as behemoths. There was a spooky moment late last year when the threatened takeover of RTZ by Glencore threatened to even reduce the ranks of the behemoths. Fortunately this proved to be just an attack of wind by Ivan Glasenberg. Back in the early 1980s the first stock I ever bought was a very tiny amount of BHP (as it then was) and made a good turn on it. The price was embarrassingly low compared to where the stock stands now but the early 1980s were a grim period for most miners. The first time I have even been tempted to buy BHP since then is now… and strangely it’s so I can sell it… after having stripped out the South32 spin-out as a “keeper”. Approval for the Demerger is being sought at shareholder meetings to be held in Perth and London on the 6th of May 2015. Under the spin-out proposal eligible shareholders would retain their existing shareholding in BHP Billiton and also receive a new share in South32 for every BHP Billiton share held (at the applicable record date which I understand to be mid-May). After that date South32 will be able to be kept and the BHP Billiton ditched with alacrity. Perversely this opportunity (probably much to the chagrin of BHP’s execs) reminds me of Morticia Addams chopping the heads off roses to keep the thorny stem. In the minds of the big strategists in the corporate suite of BHP, the “big metals” are the ones to keep. I would rather grasp the thorny stem any day….